HBC2-7128. 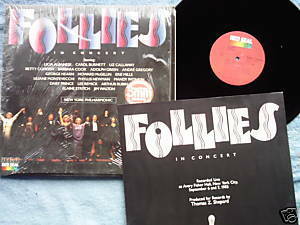 Follies in Concert. Steven Sondheim. Two LP set. Live performance from Avery Fisher Hall in New York City on September 6 and 7, 1985. New York Philharmonic. RCA Red Seal Digital. Performers include Licia Albanese, Carol Burnett, Andre Gregory, Erie Mills, Phyllis Newman, Lee Remick, Elaine Stritch. Musical direction by Paul Gemignani. Produced by Thomas Z. Shepard. Vinyl is VG; gatefold cover with photos, still protected by shrinkwrap, is VG; original insert with lyrics, photos, cast biographies, and liner notes by James Kirkwood is enclosed.